IPS carries out its Customer Satisfaction Survey through an independent third party* to monitor our customers’ experiences and provide us with direct critical feedback. 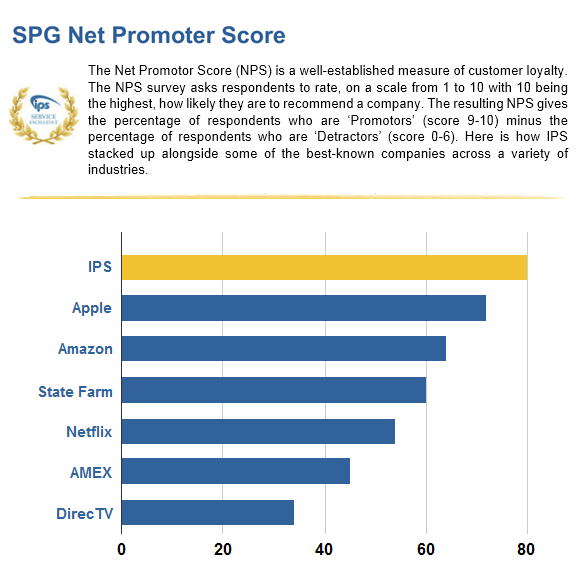 SPG ranked IPS as the #1 company in terms of customer satisfaction! Our outstanding success results from our proven focus on customer satisfaction! This phone survey is conducted annually during the fourth quarter. Results are published during the first quarter of the new year. Our staff then meets to review the findings, identify areas for improvement and enact changes to ensure the improvements are carried out. * Strategic Performance Group, LLC (SPG) is an independent, third-party international management consulting and market research firm based in Minneapolis, Minn.